As a teen, it’s natural for your son or daughter to care about their appearance. They want beautiful straight teeth that they can show off with confidence as they take photographs with friends. But did you know that orthodontics can also benefit your teenager in other ways than their self-esteem? Issues such as tooth decay and orofacial development also come into play. When you see our dentist in Austin for an orthodontic consultation, we’ll address all of your concerns and give you appropriate recommendations on how to address them. Our practice offers braces in Austin, TX to correct problems with a misaligned bite, as well as jaw problems related to malocclusions (crooked teeth) that may cause pain. How Can Braces Help Your Teen? Crowded and crooked teeth may be a result of having a narrow arch. With braces, we can perform an arch expansion which makes more room to be able to align the teeth. Spaces and wide gaps between teeth can be closed. Teeth that are set too far in the gum (and look short) can be moved vertically to become aligned properly. If you child sucked on a pacifier after the age of two, then they may have an open bite. This condition means that when they bite their teeth down, their front teeth don’t come together. But rather you can see an open space where the pacifier used to be. Crossbites, where some teeth sit behind their opposing tooth and others sit in front of. Underbites, where the lower teeth sit in front of the upper teeth (in a proper bite, the top teeth slightly overlap the lower ones.) An underbite could be because the lower jaw is protruded forward, which may need to be addressed with conventional braces. Overbites, where the upper teeth close over or in front of the lower teeth. In some cases, the lower teeth will be completely covered. This is also known as a deep bite and can be corrected with braces. When Should I Schedule My Teen’s Ortho Consultation? In actuality, it’s best to bring your child in for their first consult around the age of seven. This seems early, and children still have a lot of baby teeth present at this time, but it’s important to evaluate their orofacial anatomy earlier when possible. If we spot any issues with your child’s oral or facial development, we can intervene and initiate treatment to prevent more complex problems. Typically, most children and teens get braces between the ages of 10-14. A lot of it depends on their physical anatomy and individual development. If you’re not sure if we should go ahead and see your teen, then it never hurts to schedule a consultation with our dentist in Austin. We’re glad to answer any questions that you have. Once your teen is ready for braces, there are different types of orthodontic treatments that we can consider. Together, we’ll select which is the best option to meet your family’s needs and lifestyle. This time-tested method that has been around for centuries. Orthodontists today still depend on tried and true brackets and wire systems to straighten teeth. In fact, with some complex cases, this is the only braces option that can help. Some Austin teenagers don’t want to be seen with a mouth full of metal. Tooth-colored or ceramic brackets work just as well as the conventional ones do. This option helps to provide straight teeth in a more discreet fashion. Our Austin dentist office accepts most insurance plans and offers flexible financial arrangements for braces of all types. Although slightly more expensive than traditional orthodontics, lingual braces can provide your teen with an “invisible” treatment that most people won’t know they have. This system uses wires and brackets that look like the conventional form of braces, but they’re put on the inside (tongue-side) of the teeth! Not all patients will qualify to get lingual braces, so if you want to go this route, then it’s best to have a thorough evaluation first. A popular choice for braces in Austin is Invisalign Teen. Many young adults don’t want to have metal appliances during their high school years, as it can affect their self-esteem, and even prevent them from being able to play certain instruments in the band. But with Invisalign Teen clear aligners, your teenager’s life can go on uninterrupted. Our Austin Invisalign Teen system works by using a series of custom-made, clear, plastic aligners to straighten teeth. At the start of treatment, all the aligners you’ll need will be digitally mapped out in advance. Each pair is slightly different from the next, progressing the transition of each tooth’s position. Invisalign Teen is specifically made system for teens to help them keep track of the time they’re wearing them. Parents and dental providers can also check to see if your child is wearing their aligners as directed. The average time each pair of trays needs to be worn is 22 hours a day, for 14 days. This allows ample time to take them out for meals, brushing, and flossing. 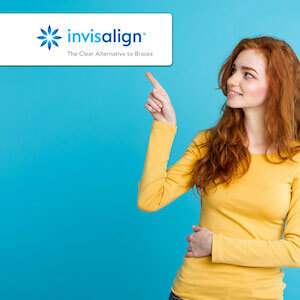 The Invisalign Teen aligners are equipped with a “compliance indicator” which shows us when the pair of trays has been worn long enough and the patient can proceed on to using the next set. Another great feature of Invisalign that other braces don’t offer, is the fact that they’re removable. This makes oral hygiene as easy as ever, gives your teen freedom to eat all their favorite foods, and common problems like broken brackets or enamel decalcification can be avoided. The professionals at Westlake Pediatric Dentistry provide comprehensive teen and family orthodontics in Austin, TX. We aim to provide you and your teen with the best oral health care possible. Call our dentist in Austin today at 512-732-0022 to schedule a consultation for your teen or yourself!